This vast nature reserve extends from the little coastal town of Salema westwards around the coast at Cape St Vincent itself and then northwards as far as Odeceixe on the way up to Lisbon on the western coast of Portugal. Protected landscape status for this area dates from 1988, and in 1995 Parque Natural do Sudoeste Alentejano e Costa Vicentina (the Natural Park of Southwest Alentejo and Cape St. Vicent) was designated to conserve the outstanding beauty of the coastline and also the region’s unique flora and fauna. Although there is no information centre for the Parque, signs on the roads running throughout the area alert you to the fact that you are entering the reserve. There are numerous towns and villages within the Parque and they all have their share of cafes, shops and toilets, so there is no shortage of facilities if you choose to spend a day visiting the area. Recently opened is a gift shop and cafe beside the lighthouse at Cape St Vincent. This resource is much more focused on the natural environment of the area than the other gift shops, and you will be able to get help and advice about your visit to the Parque. It is closed during winter but reopens each year at the beginning of April. 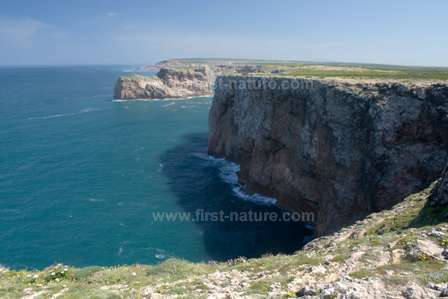 The dramatic, 100 metre high cliffs at Cape St. Vincent consist of hard dolomitic limestone very unlike the sandstone cliffs with which the Algarve region is generally associated. The numerous plants that live on the limestone cliffs have capitalised on the sand which, as a result of filling the cracks and fissures in the rock, maintains a higher level of moisture than would generally be found in this inhospitable and windswept environment. Although the cliffs at this most south-westerly point of Europe tend to be the focal point for the casual visitor to the Algarve, for those interested in the natural world the whole area of the Parque is a revelation. The superb sandy beaches along the coastal strip, the outstandingly beautiful flora along the cliffs, the numerous wildflower meadows, and the mixed Cork Oak, Quercus suber, and pine woodlands in the region offer an unparalleled opportunity to observe the teeming and diverse wildlife of the western Algarve. Ophrys tenthredinifera grows among the shrubs at Cape St Vincent. Although the ocean that pounds the coast of Parque Natural da Sudoeste Alentejano e Costa Vincentina is the Atlantic, the warm wet winters and long hot and dry summers are far more reminiscent of the Mediterranean region. As a result the plants, birds and animals found in the Parque are far more typical of the Mediterranean than they are of the northern European countries, the coasts of which are also dominated by the Atlantic ocean. Apart from the unique plantlife within the park, the area is also famous for its birds, some of which nest on the rocks and cliffs while others use this ‘first and last post’ in south-western Europe on their migratory journeys. Other animals can be found in the Park, too: Otters, Gennets, Badgers and the Egyptian Mongoose are reported from the area, and the Park's woodlands are home to Wild Boar. Tearing yourself away from the amazing flora you will see on the clifftops at Cape St Vincent in any visit during April and May can be difficult. These windswept cliffs at ‘The End of the World’, as the Cape was known in the Middle Ages, are dominated by Cistus palhinhae, which closely resembles the Gum Cistus found throughout the rest of the Algarve except that the flower petals of this species do not have the maroon spots that occur on the petals Cistus ladanifer. 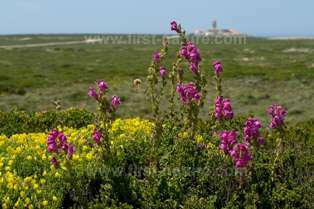 A closer look, particularly at ground level, reveals some of the other special plants that grow at the Cape including Algarve Toadflax, Linaria algarviana, and Astragalus tragacantha as well as Shrubby Violet, Viola arborescens – a rare plant found only here at Cape St. Vincent and at Cape Trafalgar in Spain. Both the creamy-yellow and purple-flowering types of Honeywort, Cerinthe major, are common as also are both colours of Bellardia, Bellardia trixago. Red wild Snapdragons, Antirrhinum spp. bloom at the Cape, any yellow ones are likely to be garden escapes. Also, some of the many Algarve broomrapes appear there including the majestic Orobanche foetida which has dark red and yellow forms. 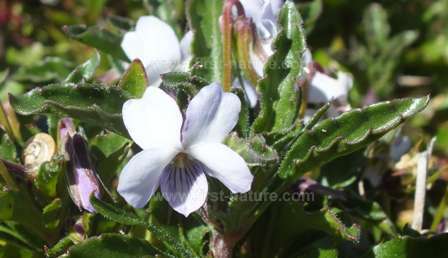 Shrubby Violet Viola arborescens grows on the roadside at Cape St Vincent but is hard to find. It flowers in late March and early April. Shrubby Violet Viola arborescens is very rare and occurs on roadsides along Cape St. Vincent. Its chosen habitat does not help with its survival as numerous cars and other vehicles use the roadsides as parking places: it is a matter of getting out and walking along the edge of the road in the hope of finding this diminutive plant with its pale and rather insignificant flowers. One of the prettiest of the wildflowers is Evergreen Candytuft, Iberis sempervirens, which forms brilliant white pincushions from early April onwards; it is generally accompanied by bright pink Sea Stock, Mathiola sinuata, and deep purple clusters of Shrubby Pimpernel, Anagallis monelli, which is one of the most common and memorable plants of the Algarve and found almost anywhere close to the coast. Various parts of the Parque are also home to many of the wild orchids of the region including the Mirror Orchid, Ophrys speculum, and its rare subspecies lusitanica (formerly known as Ophrys vernixia). Also present are Ophrys bombyliflora, the Bumblebee Orchid, Ophrys tenthredinifera, the Sawfly Orchid; Orchis anthropophora, the Man Orchid, Orchis italica, the Naked Man Orchid, Serapias cordigera, the Heart-flowered Tongue Orchid, Serapias parviflora, the Small-flowered Tongue Orchid and many Broad-leaved Helleborines (Epipactis helleborine). 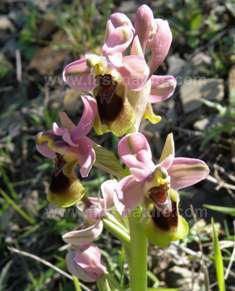 The Broad-leaved Helleborines are particularly numerous in the mixed Cork Oak and Pine woodlands in the area and the flowers show a confusing variation in colour, some being deep pink and others creamy-green. The outstanding plantlife of Parque Natural da Sudoeste Alentejano e Costa Vincentina, and its profusion of flowering plants in particular, ensure that the area is also rich in insect life. 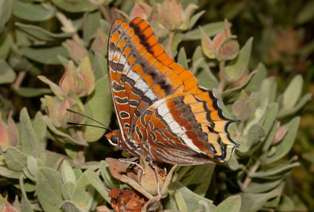 Once spring and summer get underway moths and butterflies are seen flying from plant to plant taking pollen and nectar as rewards for helping with pollination. Once the high summer arrives and temperatures soar to the high thirties and even low forties Celsius, many of the non-flying insects hide under stones to get away from the daytime heat only emerging in the early mornings and evenings to hunt for food. Those insects that fly are able to move inland and higher up into the hills, where the air temperature is several degrees cooler during the day. Cape St Vincent, and indeed also the rest of the Parque, is an area of major importance for resident, visiting and migratory birds, and if they visit at the right time of year there are plenty of special treats in store for bird lovers. Bird watchers sometimes flock to the area in throngs almost as large as the flocks of some of the migrating birds. In spring, Nightingales and Golden Orioles arrive along with many other passerines. Vast numbers of migrating birds move along the coast; these include Griffons, White Storks and Black Storks, Egyptian Vultures and Booted Eagles. 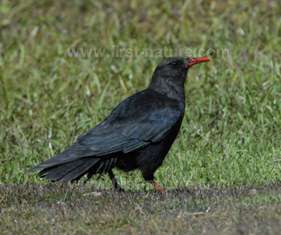 Nesting birds of the Parque include Choughs, Shags and Swifts. There is much on offer in the area for the archaeologists and historians among us. The megaliths between Sagres and Vila do Bispo speak of prehistoric occupation, and there are remains of both Roman and Phoenician settlements. Remnants of irrigation systems and wells date back to Moorish times, and there are many fine churches from the 15th to 17th centuries dotted about in the towns and villages within the Park.